Bird 161004 is waiting to follow in the slip stream of Titan, the first turtle dove to be tracked from his breeding grounds in the UK to his wintering grounds in Africa and back, and needs a name! 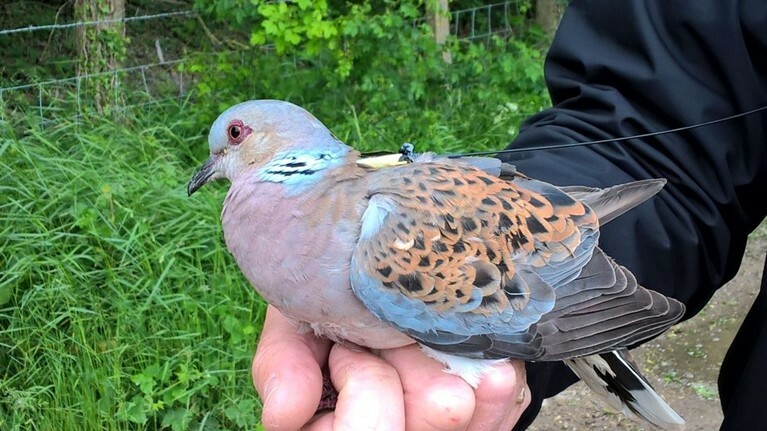 161004 is one of 6 newly satellite tagged turtle doves, which were fitted with light weight backpack trackers in Eastern England this summer. The team at Operation Turtle Dove have whittled the hundreds of possible names, suggested over the weekend by supporters of the project, down to the top three and now we need to pick a winner! By the way, Bird 161004 is male.